Les touches de ce clavier sont entièrement noires; ce n'est pas de l'usure, ça vient comme ça en usine (parce que si vous êtes assez hot pour utiliser un vrai clavier mécanique, vous devriez être assez hot pour maîtriser le doigté de votre clavier et faire du "touch typing"). The caps on this keyboard are completely black; this is not due to wear, they came like this from the factory (because if you're hot enough to use a real mechanical keyboard, you should be hot enough to master your keyboard's layout and touch type.). It is this one I think, so yes alps plate spring. Plate springs it is and PS/2 connected, no conversion necessary! Unused by the looks of it. I'm blessed!! ANSI Blue Alps, metal backplate. This seller has a ton of cool stuff. Not a great find necessarily, but cheap from the local charity shop up my street: $ 3.74 for the three at the current exchange rate. Two NTC boards and one Ortek MCK-101FX. All appear to have either white alps or clones. The NTC with the diagonal navigation keys seems peculiar. Shipping to Canada + customs puts it out of my comfort zone. I'll likely be kicking myself later. Last edited by swampangel on 19 Jan 2019, 15:07, edited 1 time in total. I'm too new at this to know, but why are AT model F's somehow more desirable (and expensive) then XT ones? Because of the layout. XT is very strange—an evolutionary dead end—while AT is the father of Model M and all that came since. Thanks Muirium, that makes sense. Although I would expect that one can ameliorate some of the strangeness with key remapping (to a point). If you throw in a couple of keycaps from a model M (arrows etc.) you can end up with a layout that's pretty close to a regular tenkeyless. My first mech was an XT. So I do have a certain fondness for them. But they are just so weird. Mine taught me how to use the HHKB navigation layer, which I’m thankful for as I use that so much now, but the XT itself remains an oversized oddity unsuited to my needs. Thanks, I'll take that as a compliment. However, I think I'll let the curious do some research and find past postings of my remapped XT. Seeing the oversaturated colors of the training wheel caps can be a shock to the visual system, like that of suddenly switching to a technicolor movie from the 60s or 70s immediately after watching a classic B&W movie from the 40s. You have been warned! For me, the great features of the XT are its sound and feel. I can still remember the extreme letdown after getting my first AT -- it seemed plasticky and dead after the lively sound of the XT. But the layout of the XT can make it difficult to use. It's interesting that the relatively slight modifications to the XT layout that appeared in the Leading Edge DC-2014 and Zenith Z-150 make these boards much easier to use than the IBM XT (at least for me). On the DC-2014 and Z-150, I use the enlarged Right Bracket as my Backspace. Oh wow… those key toppers look, well, pretty careless! Zoom in on the bottom row. They are indeed just sitting on top of the original caps. Apparently quite vintage though, judging by how worn their legends are. Speaking of the legends, I can’t forgive that zero! Or the whole brown thing they have going on. Seems too even just to be yellowing. Gotta chuckle at the cockeyed Return key, the weirdest of all the XT’s rich troupe of goofballs. They didn’t even bother patching the +! Zoom in on the bottom row. They are indeed just sitting on top of the original caps. What in the world are those? 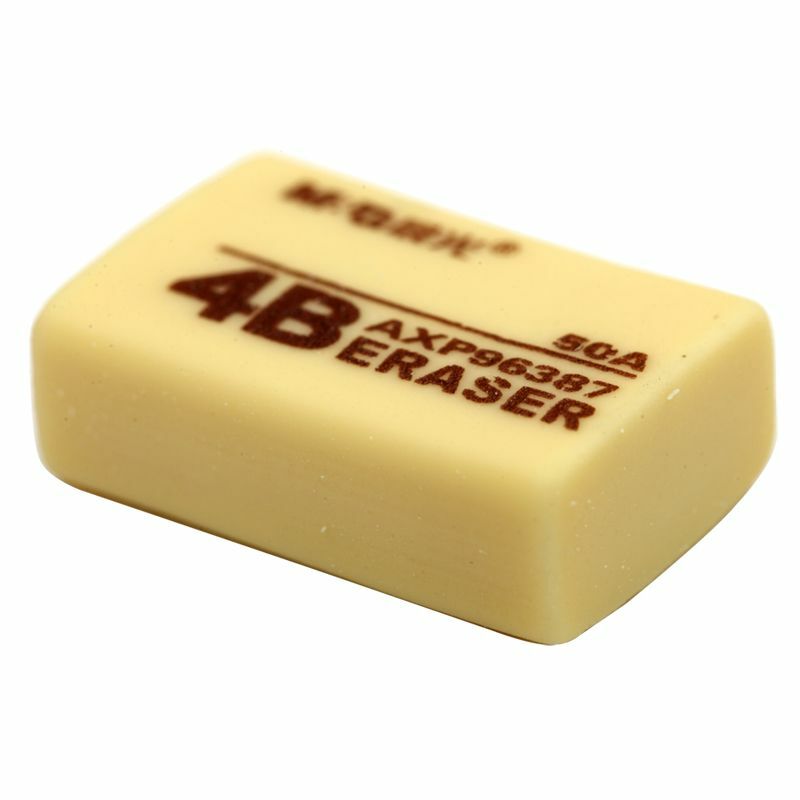 Erasers? I don't recall why I kept this keyboard, but it was something unusual I think. Besides the odd caps (which are probably aftermarket) it has a plain badge that just says "IBM". Bottom label long gone. NOS Switchboard with a trackball accessory.